While designing cool lighting products is fun and all that, there are other areas of lighting development I am involved with. Whether it is UV curing of resins and plastic parts, inspection lights, or special single spectrum light sources and task lighting, it all comes under the umbrella of lighting for me. In this case, it’s about light measurement, particularly in an easy to use, and simple to set up for gathering data for use during product development, as well as verifying and evaluating design changes in process. 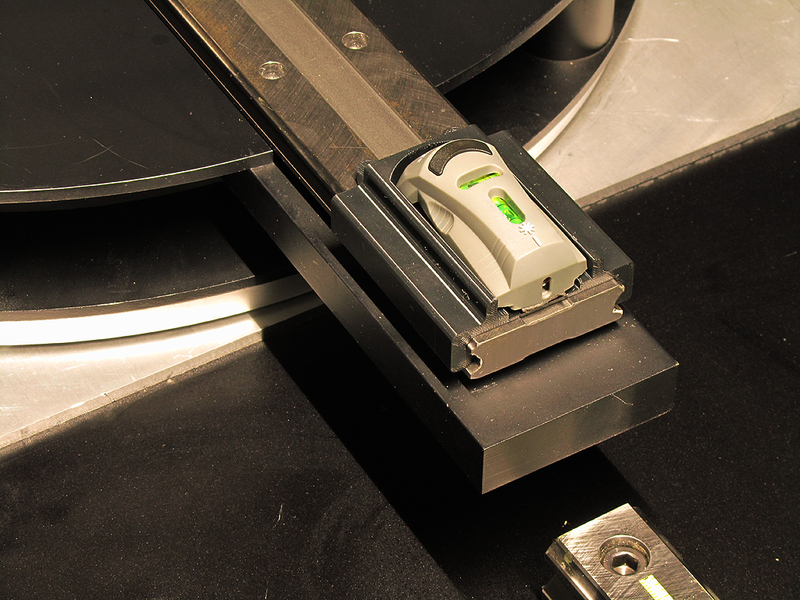 This goniometer delivers a simple to use platform for in-house testing of a wide range of luminaire configurations. 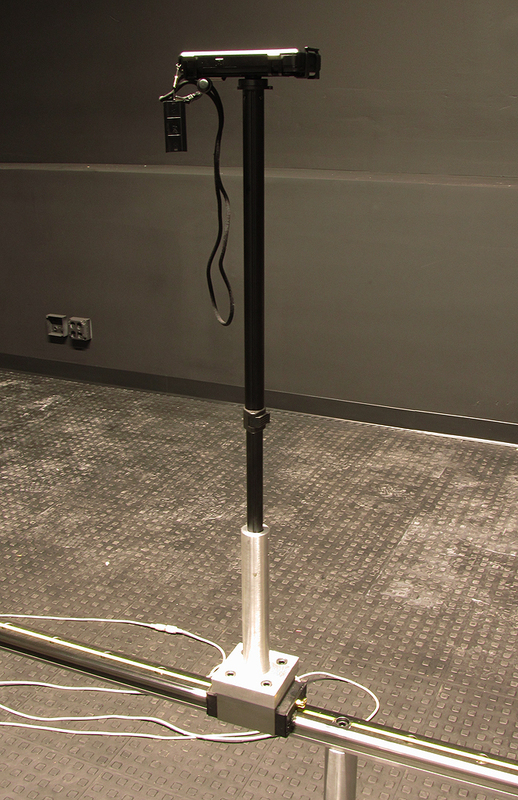 The meter can be located anywhere from 24″ to 96″ from the optical center of the luminaire. While large scale, accredited LM-79 photometry demands the use of expensive and sophisticated test gear beyond the reach of most organizations smaller than a conglomerate, a great deal of accurate data can be gained from simpler platforms. In the past I created a simple desktop Type C goniometer for customers who were creating small light source scale products. 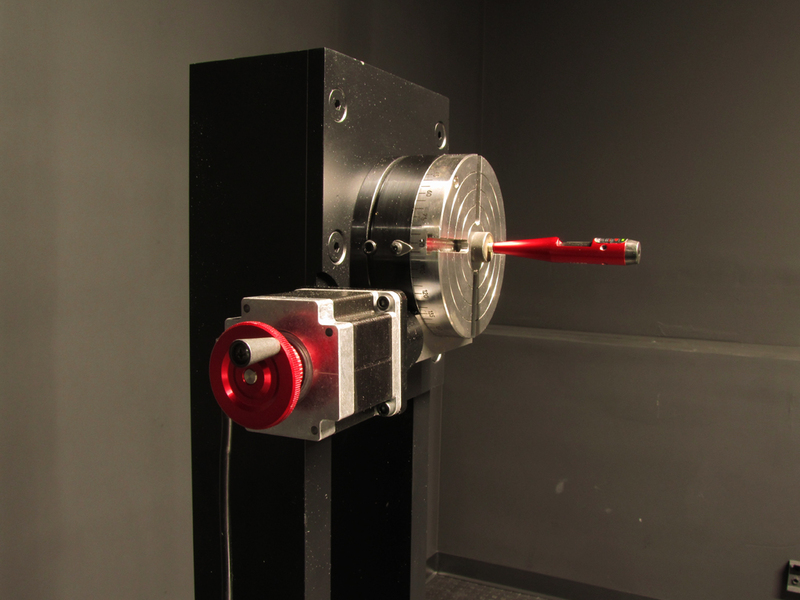 An earlier example of a bench-top system was designed for testing of small light engines and LED optics, shows the same basic configuration in smaller scale. Since then, I’ve built others with similar purpose for manufacturers setting up in-house test facilities on tight budgets. 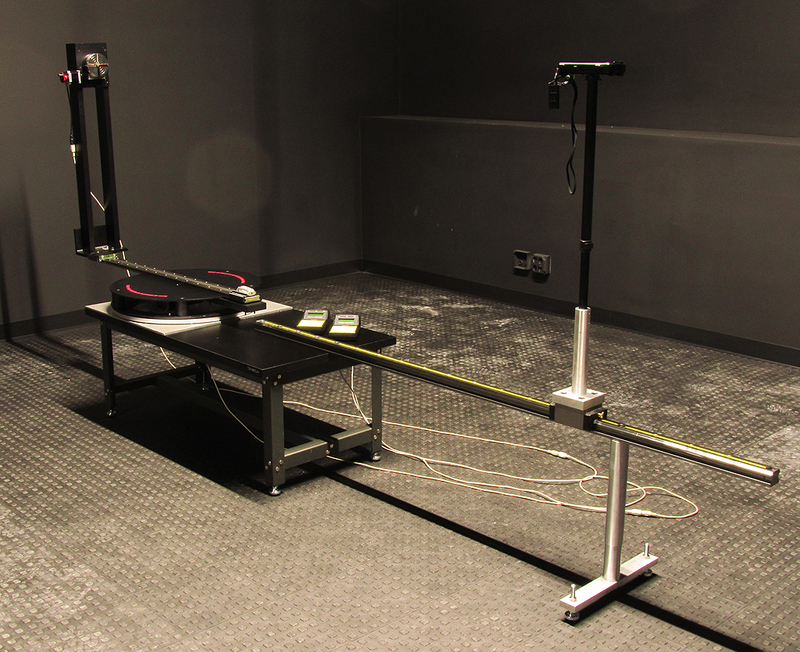 Having access to a goniometer, where tests and experiments can be carried out as part of in-house design operations can be a very valuable tool. It is also an excellent tool for quality inspections, and establishing variations on test results obtained from accredited labs. 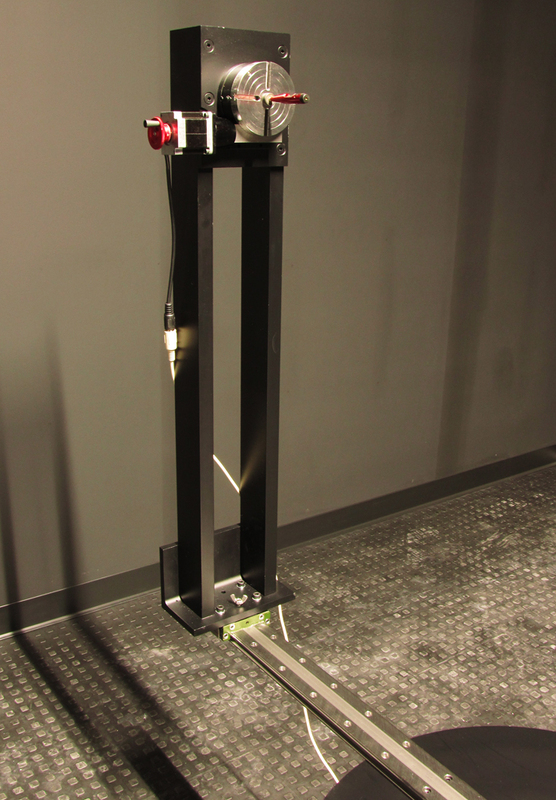 For this specific instance, the requirement was for a system for testing fixtures that might be as large as 24″ in height, and up to 48″ in length, with intensities ranging from small low power sources to high intensity optically focused products. The design is basically the same as for the desktop unit, but scaled up to accommodate the larger scale of the luminaires to be tested. Note that this is a horizontal Type C, which rotates the fixture around a fixed vertical axis, as well as the horizontal axis. This is a common approach to general lighting products, and can produce Type B results as well. However, since every test fixture is mounted with the light source aimed horizontally, including downlights, the results need to be revolved in creating usable IES files to reflect the actual luminaire orientation in use. Further, with SSL products, care must be taken to avoid including errors in light output that might result from thermal effects of mounting a vertically oriented product in the horizontal position for testing. However, in the 9 years I have been testing fixtures in this type of lab setup, I have not found this to be of significant concern. I have also devised methods for revolving the output data to create the appropriate IES formatted file for end use lighting application studies. 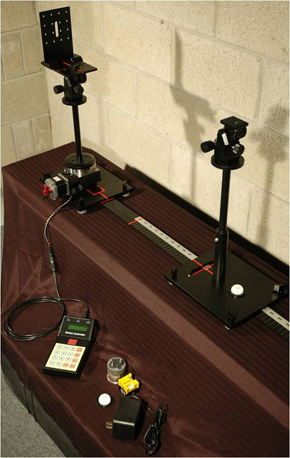 The other aspect of making this type of lab setup affordable, is the use of inexpensive light meters. While those in the business of accredited lab testing will scoff at the idea of using footcandle meters or hand held spectrometers for this type of application, I have found, in back-to-back testing, the results of tests done in house are within a maximum range of between +2% to -10% of those attained by independent lab testing services. Meanwhile, tests accomplished back to back between accredited labs using the same luminiares, has returned variations of +5% to -8%, while the variations in actual installed applications have been far greater due to the variance in surrounding reflective surfaces, condition of fixtures, variations between fixtures manufactured, and other factors outside the confines of the fixture designs themselves. So, while I am not saying this simple lab gear will replace independent test lab results (it won’t), I am saying that, if the operator is careful about setting up the test, diligent in detailing the data, and verifying his/her results, tests completed in-house, during design and between designs, can be reliable and valuable, and a significant cost and time saving advantage. The single largest variable that independent and accredited test labs bring to the table is consistency in process, and independent non-biased reporting for end user application. This is not always necessary for every test completed during and after designs are completed. Rotation of the vertical axis is accomodated using a CNC rotary table and ring bearing base. Fixture mounting is the a second CNC rotary table with T-slots to attache adapter plates. 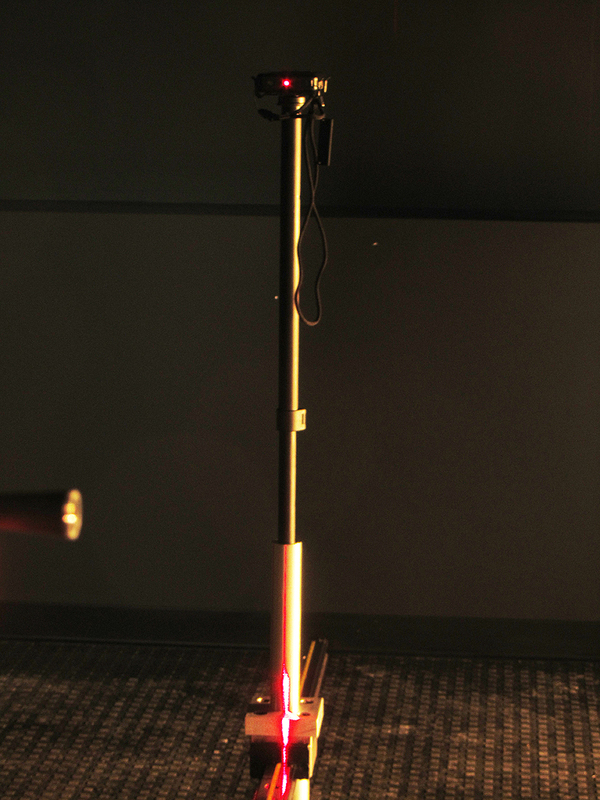 The meter attachment post can accomodate any instrument the customer might want to use, from simple light meters for quick tests, to more involved spectroradiometric testing. I have applied a wide range of meters to these types of test rigs. This includes the $100 Probe Fc meters through the more sophisticated Orb Optronix Spectrometer. The more expensive meters do deliver greater fidelity, the ability to capture multiple reading samples for averaging to eliminate error, etc.. However, I have also found that instruments like those I covered in the meter review, all delivered very similar end results. The use of the UPRTek, or Asensetek meters deliver the layer of reading color over angle in addition to standard footcandle readings, which is very useful in LED fixture evaluation. To create a candela distribution table, I use MS Excel and some simple inverse square law calcs. For this latest creation, I have includes a rail based meter mount, as well as a rail for the vertical fixture platform. This makes setup much easier, in that moving the meter and the luminaire mount along the rails maintains alignment of the two to one another. Rotation of the luminaire in the vertical and horizontal axis is accomplished using CNC mini-mill rotary tables, actuated by remote control. These can be rotated in increments as small as .006 degrees, with 2.5, 5 and 10 being the most commonly used. The vertical axis rotation table is mounted to a large diameter rotary bearing, which can support 600 pounds. With the meter post/rail aligned and the fixture center aligned with the meter sensor, the rig is ready to mount and test the actual luminaire sample. This latest rig I also includes alignment tools. One is mounted to the center of the fixture horizontal axis (a modified rifle bore sight) aimed at the center of the meter’s receptor window. The other (contractors laser line tool) is located on the rail below – emitting a vertical line for checking the zero position of the vertical axis rotating table. With these two in alignment, the rig is set to go. 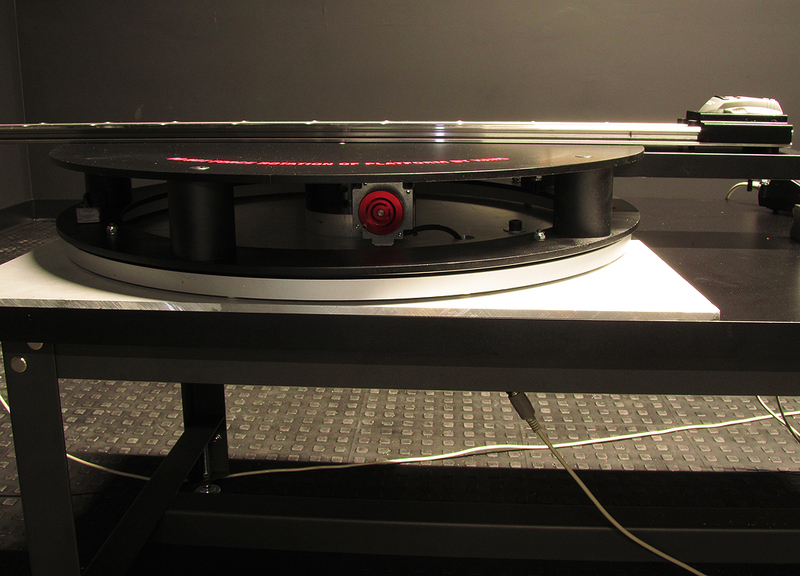 Mount the fixture using adapter plates to the horizontal axis, set the optical source to the center of the vertical axis, light it up and the temperature to stabilize, and start testing. A typical test for in-house use can take less than 20 minutes after the fixture has reached its operating temperature (2 to 24 hours to taste). There are other small additional components involved. I personally like to connect the test products to a reliable power source. The easiest way to gain this is using a UPS generally used to connect computers to. They are affordable, and offer much more reliable and consistent voltage output than wall plugs do. I also add temperature measurement (a simple Amp two position meter works for most applications – one for ambient, one for fixture hot spot), and in some case room heaters or coolers to attain a stable ambient temperature where this is not inherent to the lab itself. So that’s it. An affordable in-house Type C test rig. Not a light source, but related to development of them. I use a similar setup for my own product development, along with a cannon style integrating chamber, a small integrating sphere, and some other cobbled together test rigs that have proven to be accurate for relative comparison of results to a known standard.